As you wrack your brain for a unique gift for that special woman in your life, remember that our Therapeutic Dead Sea Salt Soaks make a one-of-a-kind gift that shows you really care. People travel thousands of miles to attain better health by bathing in the Dead Sea and soaking up all the minerals available there. Mystical Rose Herbals re-creates a bath in the Dead Sea in your own bathtub — but we “kick it up a notch” by including a bag of herbs that are infused in the hot water in your bath so you not only indulge in the benefits of the Dead Sea Salt, but you are soaking in the healing properties of the herbs as well, making your bathtub into a “body tea”. Make yourself a cup of delicious and nourishing Berkshire Meadows Herbal Health Tea, light a scented candle and travel to Israel “in spirit” — while never leaving the comfort of your own home! Select specific baths for: Skin Healing; De-Tox & Strenthen the Immune System; Stress Relief; Cold & Flu Relief; Muscle Ache & Arthritis Relief; Pre-Natal Soak; Post-Partum Soak; Menopause Soak. 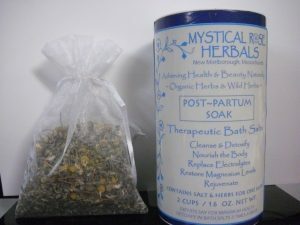 This product, which can only be found at Mystical Rose Herbals, is sold at an extremely low price of $10 per bath! Buy yours now, before supply and demand drives the price up ! This week’s deal: BUY THREE SALTS AND RECEIVE A $3 REFUND IN YOUR PAYPAL ACCOUNT! !